A great way to get started is by purchasing a CIC Introduction Kit. Each kit contains everything you need to get started. 2 gallons of CIC, Flex spay gun and connecting tubes, wet mill gage, mixing paddle and instructions. You provide a 4.5 gallon air compressor minimum 4 - 5 CFM (40 - 50 psi) with 3/8” air hose. 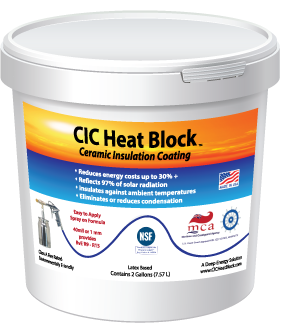 You can apply CIC Heat Block to the exterior wall on the hottest side of your house and feel how much cooler that room becomes. 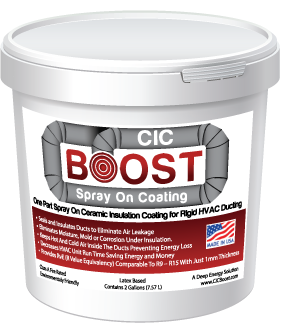 You can apply CIC Boost to exposed rigid duct. It will reduce heat load, prevent rust and corrosion and lessen the run time of your HVAC unit. 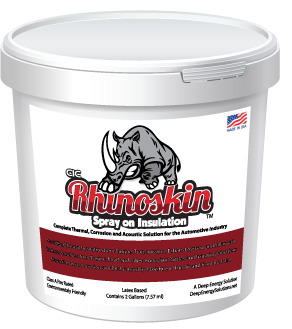 You can apply CIC Rhinoskin to the inside of your truck or car to reduce heat load, noise and rust. Application thickness? 20 mil vs 40 mil applications. Deep Energy Solutions recommends a coating thickness of 40 mil for all three ceramic insulation coatings. 20 mil can be used if product is being applied to the inside of a home to prevent thermal bridging. 20 mils can also be used if the primary goal is reflectivity and not maximum heat load reduction. Keep in mind that 40 mils of coating results in a smooth finish. If you are applying over stucco and want a textured finish you will need to add texture on top of the final coat with a drywall hopper. CIC can be primed and painted or the last coat of CIC can be tinted. We recommend lighter colors due to dark colors becoming a heat sink. Recommended when a textured finish is desired. For use on rigid HVAC ducting. For use in the transportation industry and metal buildings and containers. For all other uses including use in the building envelope, walls, and roofs. Click on the shop link in the menu above to place your order!